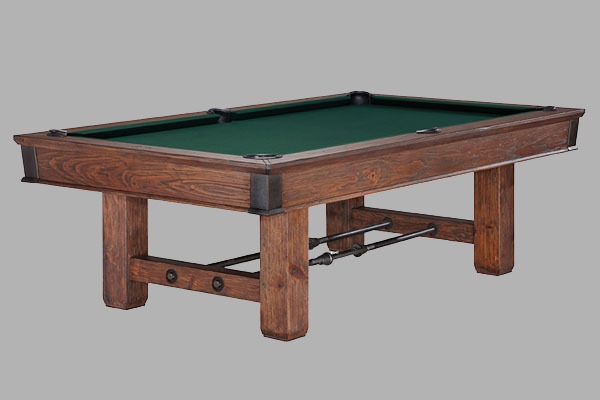 The Merrimack is a rugged and rustic table that includes a hand rubbed Nutmeg Antique Finish. It is available in an 8ft option only. 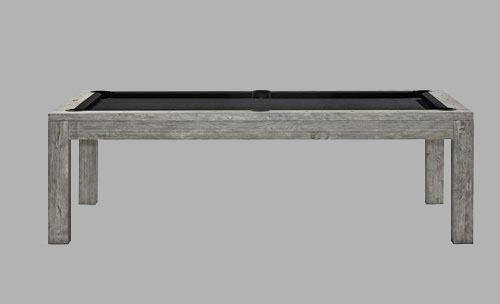 It features hammered metal rail sights with a base frame dovetail. The Gold Crown VI continues Brunswick's tradition of excellence its familiar design with modern styling. Available in your choice of Matte Black, Mahogany or Skyline Walnut Finish all with Nickel Trim. This table comes in a 9ft option only and your choice of leather drop pockets or the gully return system. The Centurion features an attractive and sturdy pedestal style legs, and is available in Matte Black and both in 8ft and 9ft. It has a both the Enclosed Pocket and a Gully Return for whatever style you would like in your house! The Brixton is available in a Driftwood Finish with its Hammered Metal Rail Sights. 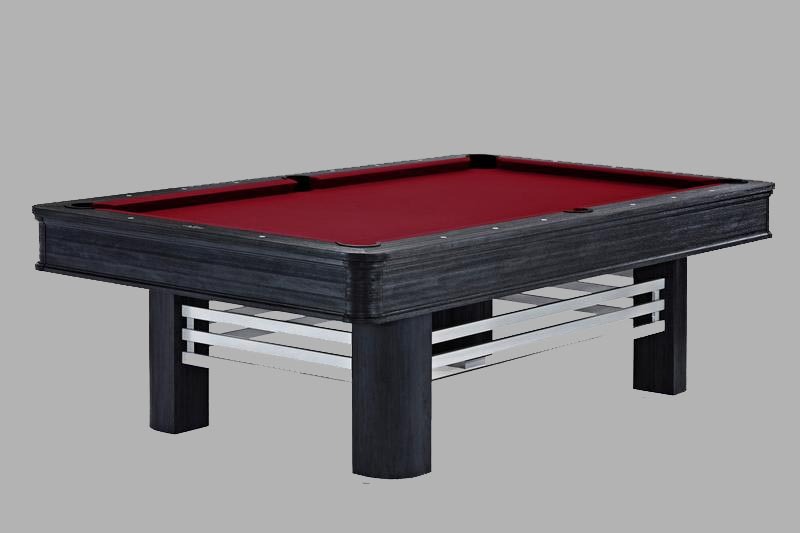 It is available in both the 8ft and 9ft and features clean lines and a sturdy yet streamlined design that showcase the unique "X" foundation underneath the table. The Bridgeport comes in two luxurious finishes, Graphite and Espresso and is available only in a 8ft size table. 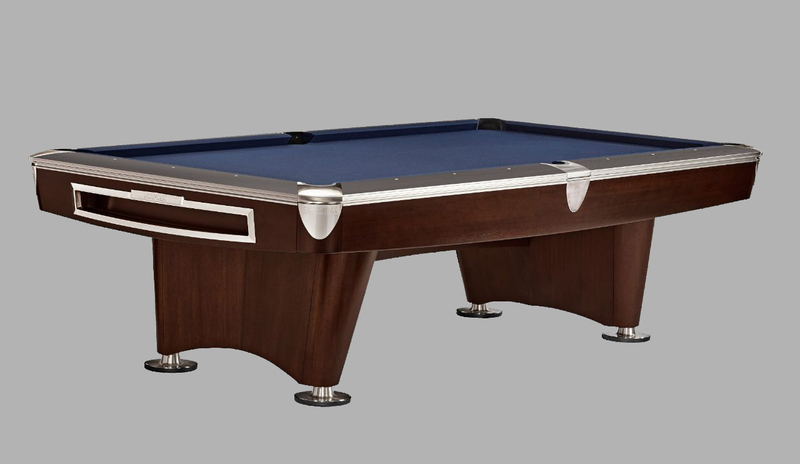 The best feature of this table is the optional sliding drawer that come out of the side of the table which is perfect for your cue sticks storage and accessories. The Birmingham has a rugged charm with an industrial look that gives your room a vintage touch. Incomes only in a Charcoal finish but is available in 8ft and 9ft sizes. It also comes with either a Unique leg or a Standard leg. The pedestal base includes a Cast Iron feature with Hand Hammered Rail Sights. The Park Falls is a beautiful refined table crafted out of white oak. Accentuated by its Greystone finish it drawn on natural earth tones. It features Diamond-Shaped Antiqftue Black Metal Rail Sites and Leather Drop Pockets. This table comes in an 8ft option only. The Canton is a unique rustic meets industrial table available in your choice of Black Forest or Rustic Grey Finish. This one of a kind table features aged metal turnbuckle stretchers, corners and hardware and artful hand hammered sights. This table is available in an 8ft option. The Glenwood is a graceful addition to any home. One of the most versatile tables in the line offering a wide variety of finishes, leg styles, cloth and pocket styles. It is available in both 7ft and 8ft options and can be fully customized. The Treviso table is of a solid hardwood state and contains super speed rail rubbers. It comes only in Espresso color and is available in a 8ft and 9ft. It has an enclosed pocket and is stylish with its arc legs on each side. The Sanibel is a solid hardwood table made of White Oak in a Rustic Grey Finish. 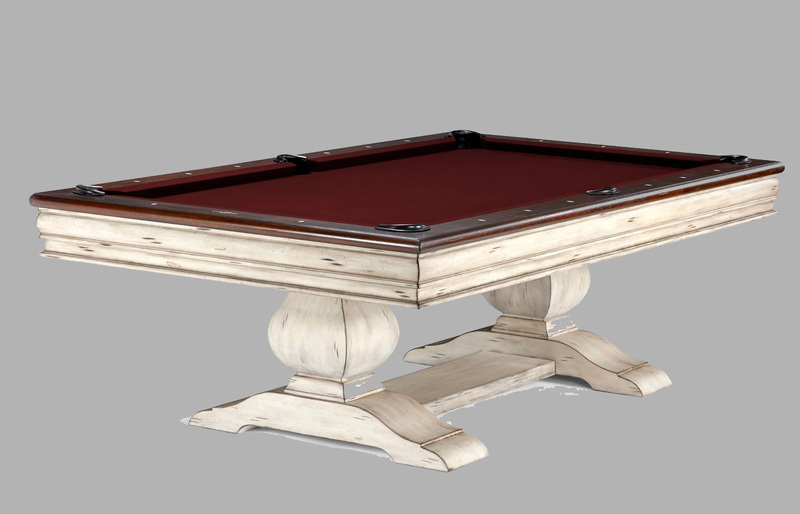 This table features high performance nut plate construction, super speed rail rubbers and hand hammered rail sights. Available in an 8ft option only. The Brooklyn is a solid hardwood table featuring silver powder-coated stretchers and brushed metal sights. This table comes in an 8ft option and brushed matte black finish. The Mackenzie is made of solid hardwood construction in a beautiful Anitique Linen finish. Mother-of- Pearl Rail sights add elegance to this already distinguished table. Available in both 8ft and 9ft options in Antique Linen Finish Only.